Photo courtesy of Bodeck Hernandez of his work for the Cambodia Town Mural Project. Bodeck stands between volunteer artists Jason Chang and Christian Orozco. 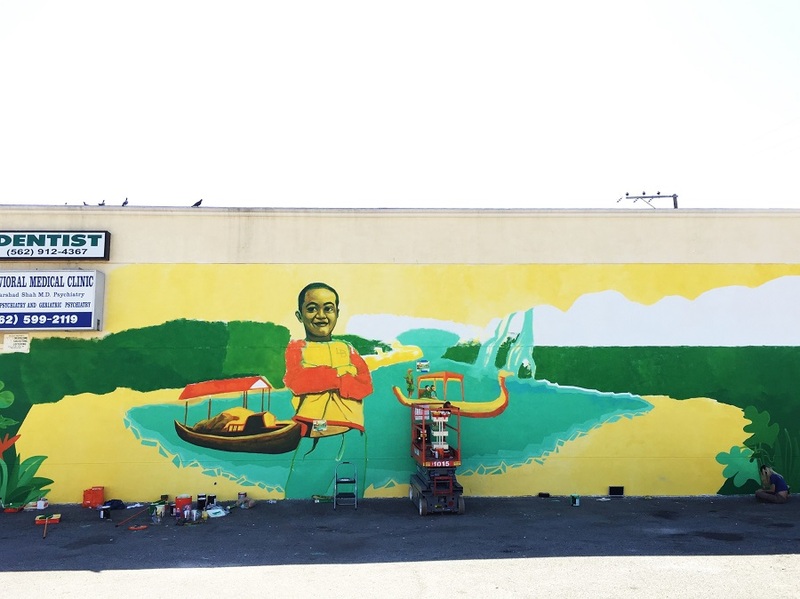 Hernandez is exhausted, jet-lagged, and relieved after finishing his first-large scale mural in Cambodia Town, a painting that has prepared him for his next piece for Pow! Wow! Long Beach. Aside from finishing a massive mural on a tight deadline, he just got back to his Retro Row apartment from visiting family in the Philippines for the first time in 16 years. It’s been a long journey for Hernandez, one which mirrors a path to rediscovering himself as an artist now living in Long Beach. Born in Manila, Hernandez was raised in the Philippines and migrated to America with most of his family at the age of 14. His family eventually settled in Long Beach and while attending Wilson High, culture shock and discrimination coldly greeted a young Bodeck. Hernandez working on his mural for Pow! Wow! Long Beach at 3rd Street and Redondo Avenue. Photo by Asia Morris. Hernandez struggled with attempting to act “more Americanized,” by dressing and speaking differently to fit in, the suppression of his Filipino roots he attributes to a faded memory of his childhood in Manila. Juxtaposed against lush, primary colors, Hernandez’ work is unforgettable; trapped behind the veneer of what looks like a faded VCR tracking screen are big, bold faces lost in a near-dreamlike scene. His pieces portray memories on pause, a heightened sense of realism with pixels and faces missing, a recollection of an event that may or may not have happened the way he remembers. Photo courtesy of Bodeck Hernandez. If you’re wondering where you can see Hernandez’s work, you won’t have to go far: the local artist’s visual language decorates a wide swath of Long Beach. 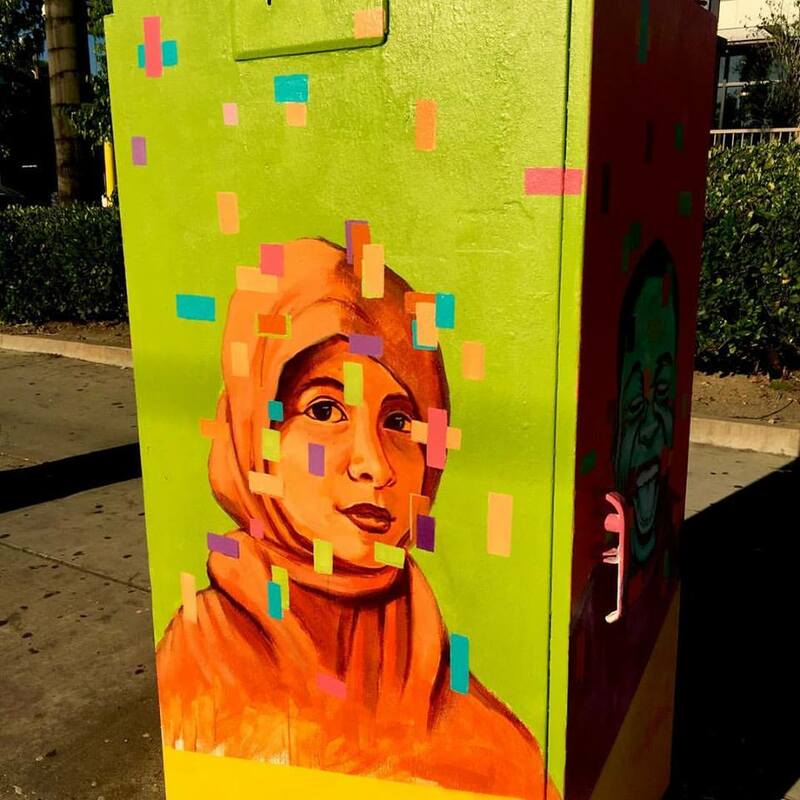 On PCH and Long Beach Boulevard outside of a McDonald’s is a utility box, adorned with a painting of a young, smiling Syrian woman. The choice of gender and ethnicity, he said, wasn’t random. Aside from the utility box art, his first large-scale mural is a piece that was painted during the Arts Council for Long Beach’s Cambodia Town Mural Project. He enlisted the help of friends, fended off cops trying to shut him down, and finished in a tight three weekends, all before his trip to see family in the Philippines the day after deadline. Hernandez’ Cambodia Town Mural Project work in progress. Photo courtesy of Bodeck Hernandez. It’s also a piece that he’s proud of, and one he hoped to make a statement with. 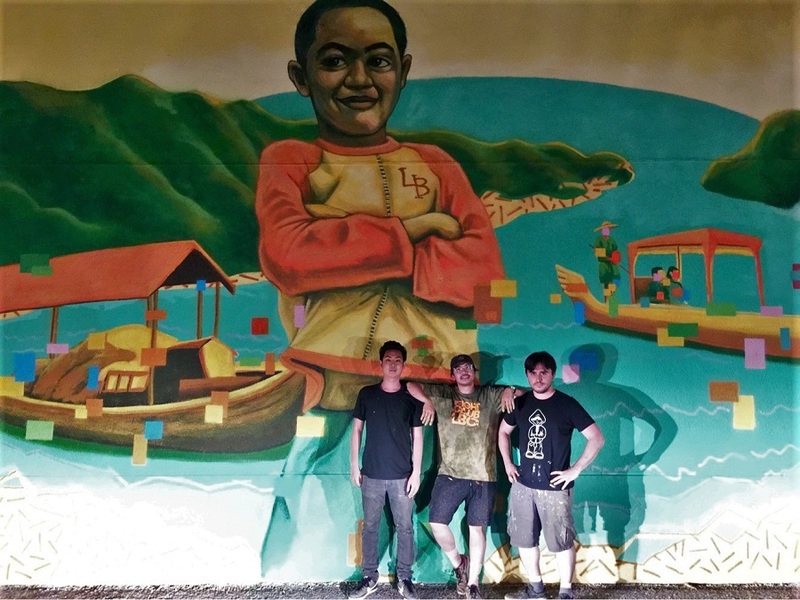 After considering making the mural with a sunny, beachy disposition, Hernandez wanted to shine a light on a marginalized group in Cambodia—blue collar workers. As for the giant golden boy with confidently crossed arms standing front and center, Hernandez says that was a carefully considered choice as well. Hernandez working on his mural for Pow! Wow! Long Beach. Photo by Asia Morris. For his Pow! Wow! Long Beach piece this year, Hernandez is ecstatic (“it’s wild when Jasper Wong sends you an email telling you you’ve been selected”) and aims to keep his art site specific. When pressed about what he’ll do for the piece, Hernandez played coy, but assured it would be light-hearted in tone.